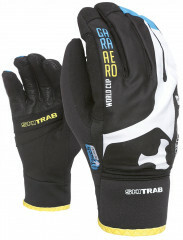 The Gara Evo World Cups are lightweight racing and adventure gloves with retractable wind protection. Uniquely the wind covers stow into the back of the palm, as opposed to the wrists. This adds a bit of warmth to the back of the hand while stowed, and also prevents reducing circulation through the wrists. The glove body is built with lycra fleece and a breathable Schoeller fabric that is pleasant to wear. Anatomical fingers and polyurethane reinforcements make it a glove you can wear all day for many days. Ski Trab really did a nice job on these. 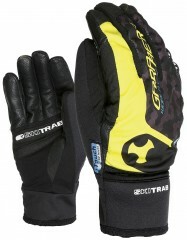 Air-Net Tech insulation makes it warmer than some other gloves in category. Windshield storage pouch doubles as a chemical warmer placement when deployed. Air-prene cuffs are easy to get a jacket over and keep it warm where blood flows. AMARA reinforcements on the palm and around the thumb should last a while. Terry cloth wipe on the thumb and finger touch fabric finish of the nice piece. Update for 2017/18: Ski Trab left one of the best gloves on the market unaltered, except for a new Black, White, and Blue color. These gloves have surprisingly small dexterity for such a small glove, probably because the liner and shell seams all bunch up at the fingertips. The elastic cuff isn't all that elastic and putting these gloves on is a royal pain. Once finally on these are comfortable and warm. 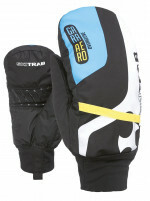 Is there a size chart for the Ski Trab gloves?  Lawrence, I looked on Ski Trabs site, no sizing charts. There is not really any standardized glove sizing. Please contact us at Help @skimo and myself or someone with similar sized hands can try on for you. 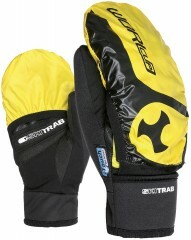 Super psyched on these for late season enduro tours. They are a little on the small side. I'd recommend sizing up if you are in between. This was the first glove I've used with the overmitt, and I was surprised at how much of a difference it makes. Highly recommended! Surprisingly warm for how dexterous they are, largely due to the good windproof material used on the back of the fingers/hands. The overmitt is well designed in that it doesn't cover the thumb - I've used the Camp version and it always gets shredded between the thumb&fingers.